I have been into landscaping for a while now and up until a couple months ago I would go to the Home Depot to get my tools. I mainly do the typical lawn mowing so I did not buy a chainsaw or anything to extreme a first. Until I realized that some of my trees had roots that where ruining the grass and branches that blocked the view. I was thinking of buying a saw and had no clue which one to get or what would work. Honestly the first thing that popped into my head was cartoon characters cutting down trees. So like any modern man I googled saws for landscaping and came across the whole world of products. My thinking was generally I need to make a price first based decision. Since I wasn’t going out and trying to cut through a forest or anything like that. So the 200 dollar professional saws with almost super powers were just not in the conversation for me. Also I was introduced to the concept of a pole saw. I honestly had not ever seen anything like that before and I was getting ready to look for a ladder or thinking of a way I was going to get up the tree to be able to do something about the branches. Then I start noticing the differences between the gas powered and the electric powered saws. I have a gas lawn mower and it has really given me fits over the years. It’s like having an old used up car. They are difficult to start make you spend tons on gas, and break down easily. So when I saw that there where electric options I gravitated to them instantly. The Sun Joe SWJ800E 8-Inch 6.5-Amp Telescoping Electric Pole Chain Saw seemed to check alot of boxes for me, so I made the leap and purchased it. 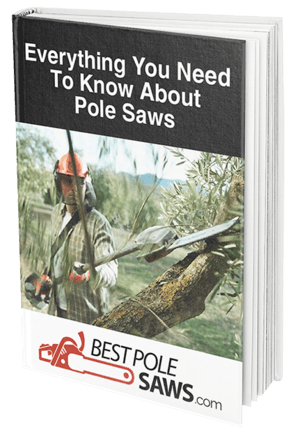 What ultimately caught my eye about the Sun Joe SWJ800E 8-Inch pole saw was it had like 80% decent reviews which seemed honest I actually went through and read many of them. The ones that actually sold me the most on buying it where the constant easy to use and easy assembly. Like I mentioned with my lawn mower I hate the part of playing mechanic. I know for a lot of guys it's like a boost of manhood, but honestly for me it's getting through a job as quick and clean as I can really. Another huge upside was that it was said not to leak a lot of oil from the chain. That’s also a huge deal for me keeping it as clean as possible. This is actually true when I started using it I had no leaks no issues then again I may not be the best person to ask. However I imagine that if you are holding up a pole it's not fun at all to have oil or any other substance coming back at your face. I could just picture that scene all oiled up in a hot day and it's not a good looking thought. Also the pole is adjustable some of the other pole saws I looked at did not have an adjustable pole length. So you always had to be standing 8 or 10 feet away from your target even if it was at an arm's length from ground level. That probably gets very frustrating very quickly especially the first days. When I started trying to cut down a couple of branches getting use to grabbing the pole and cutting from a distance takes some time no matter what. I always feel like the closer you are the more control you have. It’s like trying to hit a chip shot with a driver! With the adjustable pole you don’t have that problem. Like I mentioned earlier it is easily assembled so you really don’t have to be a rocket science to do it. Word of advice guys read the manual! I’ve been guilty of this too! We buy something and try to put it together just on our instincts alone. Then we want to call up the company and complain about their product. Most of the knocks on the Sun Joe SWJ800E 8-Inch where that it did not work properly after a couple of days. That was a huge turnoff because the first thing you think is that you’re getting a cheap product. I have used for months now and I can tell you if you follow the instructions and assemble it right you shouldn’t have any issues. Like I said at first if you try to cut down the whole forest it won’t do you any good. It cuts branches up to 7.5 inches thick. So anything beyond that could potentially harm it and that's the main issue. If you want more power go for the Sun Joe SWJ807E. It has a 10 foot range and it cuts logs up to 9.5 inches thick. Don’t force tools that are not meant for the extreme heavy duty use! At the end of the day the idea is that you find a tool or the tools that better fit your needs at the best price if possible. If you’re like me and you need simple home landscaping tasks done the Sun Joe SWJ800E 8-Inch will do just fine. Just keep in mind these simple tips. Don’t try to over work the product, but also don’t over work yourself! The Sun Joe SWJ800E 8-Inch weighs around 8 pounds. That is not that heavy for tool with this kind of power. However 8 pounds over your head for a long period of time may not be an easy tasks for all of us out there. Another tip would be when you can let gravity do most of the work. A lot of times when we buy these types of tools we want them to basically be a wrecking ball and power through everything. That is not always the easiest way around things. Try to put it in a position where you're cutting downward not upward most of the time. The Sun Joe SWJ800E 8-Inch is a great tool for those who are starting out with pole saws. If you want to check it out go to Amazon. There you can find all of the Sun Joe brand products you can choose from. If you’re looking to buy a pole saw going electric these days is the way to go. And it's also the like buying shoes the one that fits you best is the one for you. So don’t take my word for it and give them a shot!